Stacey Snedden has been in the industry since 2004 – Stacey has worked for XPOLE International for 14 years and is now the international sales manager for XPERT Pole & Aerial Teacher Training, the world’s largest Pole & Aerial Teacher Training programme. She is a qualified fitness instructor and is a certified Pole & Aerial instructor including aerial yoga, aerial hoop to name a few. Stacey has judged many competitions over the years and is a regular on the competition judging scene. Stacey won the IFS 2016 Health and Fitness Manager of the year. Heather started pole in 2009, although she did dance and gymnastics from the age of 4. After 7 months of training pole she entered and won her first competition, the North Wales Pole Championships in the intermediate category. Since then she has gone on to win several other solo titles including All Wales Pole Championships Advanced Champion 2011 and 2012, UKPPC Instructor Runner-Up 2012, All Wales Pole Championships Professional Champion 2013. In 2013 she started doing doubles with her sister, Kristina, and they have won several titles including Pole Sports UK Doubles Champions 2014 and 2015, Miss Pole Dance UK Doubles Champions 2014 and UKPPC Doubles Runner-Up 2014. Together they also represent Great Britain and have competed in the World Pole Sports Championships three times, and placing in the top 10 every time, and twice in the top 5. Heather also competes in aerial hoop and in 2015 she came 2nd in the UK Aerial National Championships Professional Hoop category and won the UK Aerial Performance Championships Professional Lyra category in 2016. Heather is judging the pole competition and compering the hoop competition! Amy Capper (aka Miss Kitty Pimms) is an aerial performer and teacher based in Newbury, UK. Amy performs as part of the well established Scarlet Vixens Burlesque troupe, and teaches regularly at Spin City Newbury. With a passion for all Aerials, Amy specialises in Aerial Hoop and Silks, focusing on combos, flow and doubles. Amy performs and teaches nationwide, and is proud to be part of the Spin City Instructor training team. Amy is judging the hoop competition and compering the pole competition! 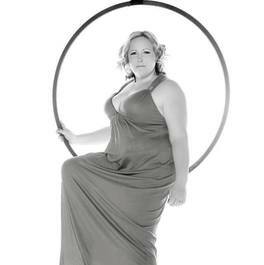 Gemma started aerial hoop in 2011 when she was studying dance at Italia Conti Arts Centre. She continued her training in London until she found the The Fitness Hangout in Godalming! She has been instructing aerial hoop to adults for 3 years and teen hoopers for a year now and takes part in various hoop and pole competitions up and down the country! She also performs aerial hoop, contortion and aerial lollipop for events alongside her teaching. Gemma is so privileged to have been asked to judge here at solent this year as this competition was her very first 4 years ago. Sarah works full time as a partner for a corporate insurance broker by day and teaches weekly pole classes at Solent Fitness & Aerial Arts. She was a judge in the final of last year’s competition! Kat is a Dr of Psychology, and also owns PoleKat Fitness in Nottingham. She poled throughout her pregnancy and during labour and believes that if you have a passion for something, nothing should get in your way. Kat & Danielle placed second in Pole Theatre Professionals when Kat was 7 months pregnant, and then went on to win Solent Pole just 14 weeks after giving birth. Kat believes in promoting pole as a sport and away from the negative stereotypes sometimes still associated with it. Kat and Danielle enjoy fun, light-hearted comedy pole, as they don’t take life too seriously and they love to make people smile. They have been competing together since 2014 and get along so well because they have a similar sense of humour. They love the theatre and character interaction that doubles pole incorporates and embrace the chance to entertain. Nicola Ghalmi, is the owner of Dance Inspires, Oxfords largest pole Dance Academy. She has been teaching the art of pole for over 10 years to thousands of men, women and children. Nicola is has competed for nearly 9 years starting in amateur competitions up to national ones with many successes along the way. Although not competing or poling anymore due to injury, she now she enjoys helping others in their own pole journeys especially in the world of comps and of course guiding her teaching team in Oxford.